MULTIPLE COPIES AVAILABLE!! PLEASE NOTE: WE PREP EVERY BOOK THAT WE SELL ONLINE WITH A NEW NAME PLATE AND ALWAYS CLEAN EACH BOOK WITH ANTI-BACTERIAL CLEANER TOO! Glencoe Spanish: Asi Se Dice! Level 1 - Student Edition [Hardcover]. Copyright-2011, ISBN:0076604233. These books are in GOOD/SOLID condition with the interior pages and binding blocks fully intact, and only MODERATE wear to the exterior covers! We ship daily, Mon-Sat. Customer service is always our top priority! Glencoe's Spanish program brings a new dimension to second-language teaching and learning. 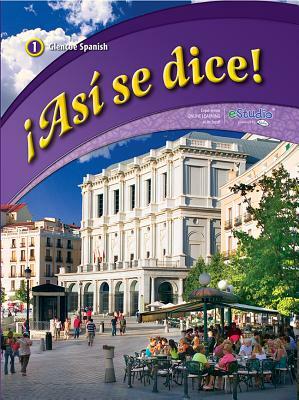 Engages students in second-language learning through visually attractive books that make learning easy Provides more in-depth study of culture through the GeoVistas section, which explores 21 Spanish-speaking countries. Includes more proficiency activities such as graphic novel format, games, and picture sequencing to help develop communicative proficiency. Increases students' aural proficiency through the use of two motivating video programs on DVD to teach culture, vocabulary, and grammar. Includes more pre-AP preparation in the program and a Pre-AP workbook for Levels 1-3.